Microsoft’s eccentric CEO will step down from his role with12 months, so what does that mean for the future of the firm? The CEO of Microsoft, Steve Ballmer, today announced he would be retiring from the role within a year, with no word of his future plans. The eccentric executive was appointed leader of the software giant back in 2000 after its founder, Bill Gates, stepped down. However, after 13 years, he claimed now was the time to hand over the reins. 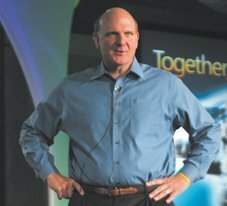 Ballmer will stay on as CEO until his successor is appointed – a job which will fall to a special committee set up by Microsoft’s board of directors, which includes Bill Gates. Ballmer has been an employee at Microsoft since 1980 – he was the 30th person hired at the firm – and was the first business manager that Gates took on. He headed up a number of divisions in his 33 years, including operations, operating systems development, and sales and support, as well as leading the development of the .NET Framework. The company is indeed very different now, facing very different challenges and getting a mixed bag of positive and negative reactions to its products. But what does the future hold for a company who has only had two bosses in its close to 40 year history? First off it is unclear what Ballmer plans to do after he steps down. Many exiting CEOs remain on the board or in some executive position – something Gates himself did in 2000 – but when we asked Microsoft spokespeople whether would stay on as a member of the board, they would not comment. As Ballmer himself experienced with Gates’ continued presence, it can be quite hard to take a company in a new direction if the old guard is still watching over you, but the in-depth knowledge of a 30 year veteran to the firm must have its benefits as well. Ballmer and the board’s decision then of his continued involvement or lack thereof will have a huge effect. Then the business itself must adjust to the changing market place, where its traditional sales are shrinking. “Like other suppliers, it will have to get beyond its traditional dependence on the PC market and role as a horizontal market player,” said Martin Hingley of ITCandor research. Silicon Valley stalwart Robert Scoble has written an open letter to the company begging for it to consider splitting up the business as well. How Microsoft will change in a post-Ballmer era remains to be seen, but it is clear the personality at the top will have a big role to play. So who will take up the mantle and become the third ever CEO of Microsoft? Scoble is hoping for a fresh face who can win over the industry. Bamforth agrees but also added he hoped the new boss would come from outside of Microsoft, rather than someone already engrained in the firm. Ballmer has up to a year before his successor is placed on the throne and who knows what the future will hold. But, for us observers, we will always have the memories.